A dominant defensive lineman throughout his four years at the University of Miami, 1983 to 1986, Jerome Brown earned consensus All-American honors his senior season. Brown was a finalist for both the 1986 Outland Trophy and the 1986 Lombardi Trophy. Equally effective at stopping the run and rushing the passer, Brown finished his UM career with 183 total tackles, including 21 sacks, 19 tackles for loss, five fumbles caused and four fumbles recovered. His sack total is still ranked in the Top Ten in school history. Brown recorded four New Year's Day bowl starting assignments: '84 Orange Bowl Classic, '95 Fiesta Bowl, '86 Sugar Bowl, and the '87 Fiesta Bowl. He went on to become a first round draft pick of the Philadelphia Eagles, ninth overall pick, in the 1987 NFL draft and was named to the Pro Bowl twice in his four year career. 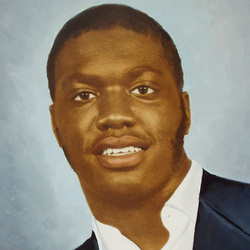 Jerome's life was tragically cut short when he was killed in an automoblie accident in June of 1992 in his hometown of Brooksville, Florida.